Are you ready to head out on a quiet retreat away from the hustle and bustle of life? 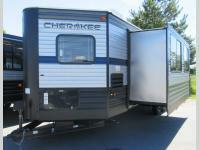 You will want this single-slide Cherokee travel trailer! This model has a V-nose design which allows for better aerodynamics while traveling. Located in the front of this model is the spacious kitchen where you can easily prepare meals with the refrigerator and the three-burner range, plus you have lots of overhead cabinets to keep all of your cooking tools. 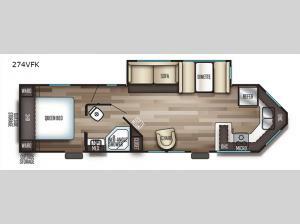 Once you set up camp, come relax indoors at the booth dinette which can transform into an extra sleeping space, the sofa, or the lounge chair. With double entry doors, you can easily slip out for an early morning fishing trip without waking any sleeping campers!